So here it is. Over 5 months later. I was 39 weeks and 2 days pregnant when I went into labor. My mom had me walk with her on Saturday and Sunday to try to get Malakai to come out. 🙂 Well, that Sunday night (June 9th) at 11:00pm, my water broke! For the next hour, my mom, Ruben, and I all ran around the house like mad men trying to get everything together. For the past week we had been meaning to pack our hospital bags and finish getting everything ready, but apparently we waited until the last minute. It was quite the sight to see as we scrambled throughout the house, trying not to run into each other. What’s funny is I had on my list of things to buy the next day: pads, just in case my water would break. Well, I obviously didn’t have pads to catch my ever leaking water, so we had to figure out something. On the way out the door, I had a towel wrapped around my waist to cover up the fact that I had a towel between my legs! When we arrived at the hospital, I put a diaper between my legs and put on some sweats. As we walked up to the counter, Jadah and Lauren had arrived with all kinds of goodies for me to eat (though I wasn’t allowed to eat any of it until after labor). We were all smiles as we took pictures and they slapped my wristband on me. 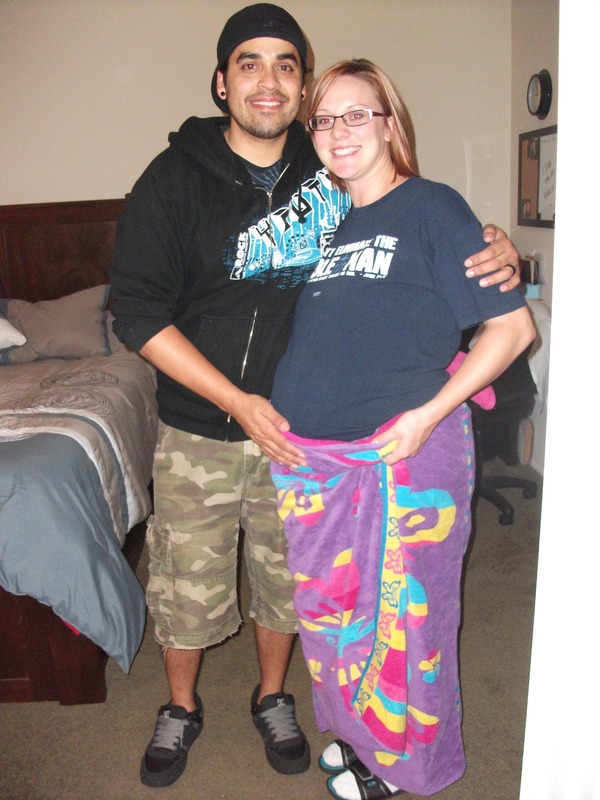 My contractions still hadn’t started at this point, and it was about 12:30 am (June 10th). Ruben and I went into a room where I had my vitals checked. I think my blood pressure was pretty high. But whose isn’t at that point? I mean, I was in labor and going to have to push out a baby! They had me change into my gown and then the doctor, ironically named Kim Smith, came in to see how far along I was. 2 centimeters dilated. Exciting! After that, they checked us right in to our labor and delivery room since my water had broken. It was a nice room (for a hospital, I suppose), with my bed, extra chairs, a bathroom, sink, and all of the monitors. At this point, I could still barely feel any contractions, and it was about 1:00am. We settled in, Ruben, Mom, Jadah, Lauren, and me, while the nurse at the time was asking me lots of questions. We were all still pretty excited at this point, and continued taking pictures. The nurse got me hooked up to the IV and wrapped my belly with two different straps: one to check baby’s heartbeat and one to check contractions. Still, they weren’t painful, yet. So we decided to try to watch some Netflix. It was difficult to do that for very long, though, because I finally did start feeling my contractions. And almost every time I had one, I felt like I had to use the bathroom. So I would have to push the call button to get the nurse to unhook me from all the cords and walk me to the bathroom that was in my room. Finally, after about 5 calls, she taught me how to unhook myself, so I could do it on my own. I don’t understand why she didn’t want to come in every 5 minutes. Ha! By now, I should have been progressing in labor, but when the doctor checked me, I was only 2.5 centimeters dilated. She suggested putting me on Pitocin to get the labor moving since my water had already broken. She said that she would check again around 6am, and if I still wasn’t progressing, she would give me Pitocin. Well, I really didn’t want to have to take that, so I prayed that God would move my labor along. I decided to try to bounce on a birthing ball to see if that would help. So there I was, sitting on a ball, bouncing up and down with my huge baby belly, eating fruit snacks. (Shhh..don’t tell!) 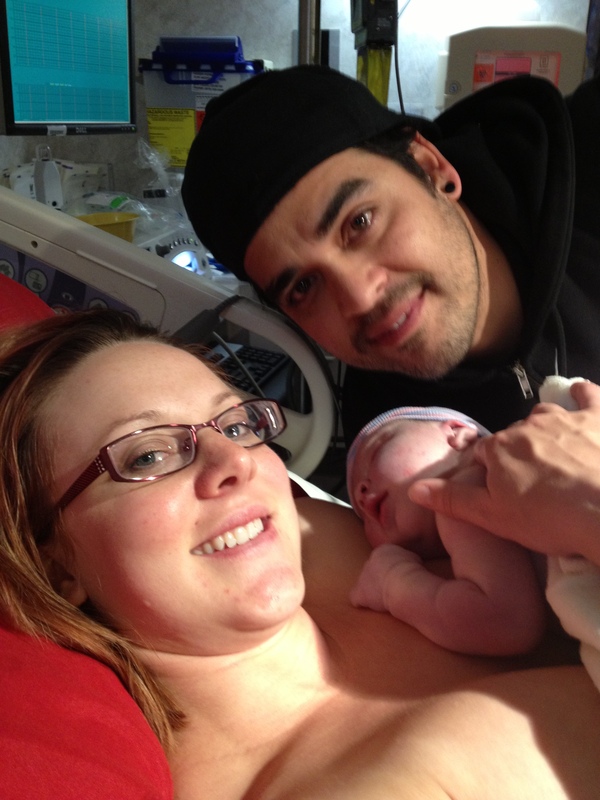 Ruben says that was his favorite “scene” of the whole labor process. I originally wanted to try to not get an epidural, believing that God could give me a pain free child birth. I knew that if He wanted to, He could get me through it without pain. I guess that wasn’t really in the plan for me this time, haha, so I decided to get the epidural. Yes, I was in pain, but I was more exhausted than anything. I hadn’t slept since the entire day before, and the contractions weren’t giving me any breaks. 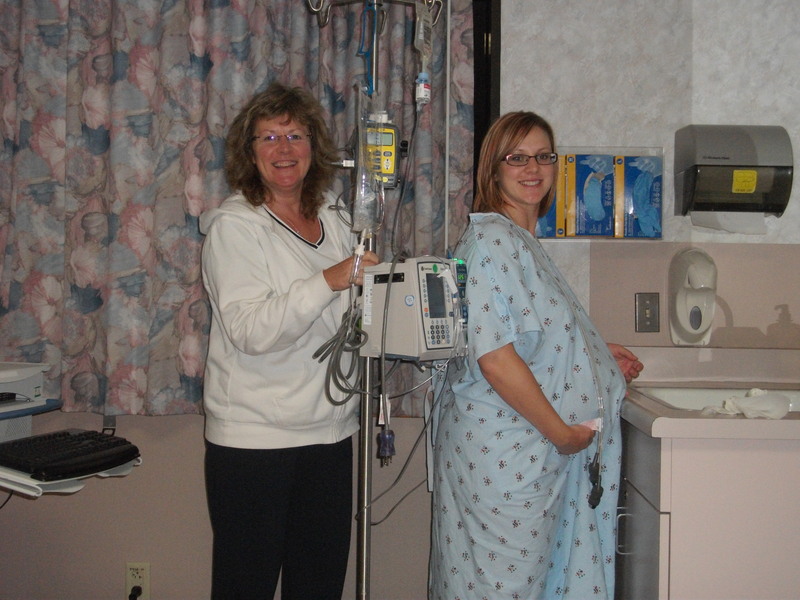 I was nervous for the epidural, but it wasn’t even bad! Probably because nothing can really compare to the pain of labor. Ruben held my hands while I hunched over like a cat as they put the needle in my back. After they were done, I laid back, felt one and half more contractions, then was pain free after that! I couldn’t even feel most of the contractions, but I could still move my legs enough to turn over if I wanted. Then, I took a short nap. 🙂 Yes, I slept while going through labor. It was probably my favorite part…besides the end result, of course. Time went by, and I never had to get the Pitocin! I was resting, but couldn’t really sleep anymore. Ruben’s mom came in to say hi, and I was texting my friends. At about 10:30am, the doctor came back in to check me. I thought she said something to the nurse about “8” and some other dialogue. So I figured I was about 8 centimeters dilated since a couple hours prior I was 5 centimeters. I asked her how far along I was, and she replied, “You’re at 10 centimeters! I’ll go get everything ready, and then you can start pushing!” It seemed at that very second, with that realization, that I started shaking. I had the shakes from then, until I started pushing at about 11:30. I did feel a little cold, but I think I was nervous for this last part! Ruben had literally just fallen asleep in the chair, and the nurse tickled his foot and said, “Wake up, she’s ready to start pushing!” He shot right up! So I pushed. And pushed. Annnnd pushed. That went on for about an hour and a half. Then I started feeling like I was going to throw up, so I don’t think I was pushing as hard. I was so exhausted and hungry! And thirsty! But since I felt sick, they wouldn’t let me drink anymore water. My voice was scratchy, that’s how thirsty I was. Finally, on Monday, June 10, 2013, at 12:58pm, after 13 hours from the time my water broke and 1 1/2 hours of pushing, our beautiful 8.9 pound, 22 inches long, baby boy -Malakai David- was born. They laid him on my chest, and everything was quiet… He was blue form having his cord wrapped around him, and he wasn’t breathing yet. They quickly took him from me and placed him on the warming table. After a few seconds, I heard the most beautiful sound of my baby boy crying for the first time. I instantly starting crying, too. Ruben got to cut the cord that was left on him after they cut him from me. Then they brought Malakai to me and laid him on my chest. I was looking into the beautiful eyes of my very own son.